Transesophageal Echocardiography (TEE) is a comprehensive diagnostic procedure using ultrasound technology and a transducer on the tip of a flexible tube to provide detailed images of the patient’s heart and the internal structures of the heart. 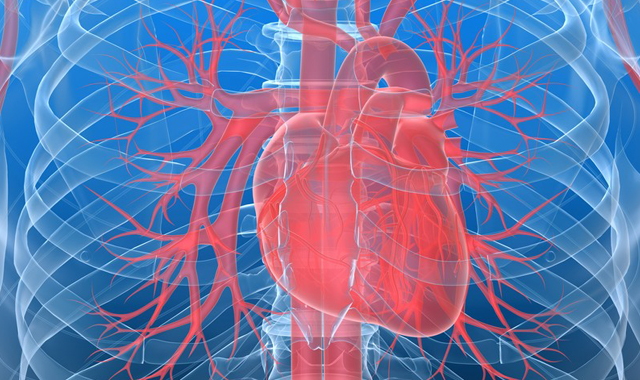 Cardiology experts use this process to evaluate heart valves, detect any blood clots in the heart or aorta that may (or can) have caused a stroke, and as a guide for treatment of arrhythmias and other heart conditions. Transesophageal Echocardiography may also be used as a visual guiding tool during a Cardiac Catheterization procedure, or to assess a patient’s status during or after heart surgery. 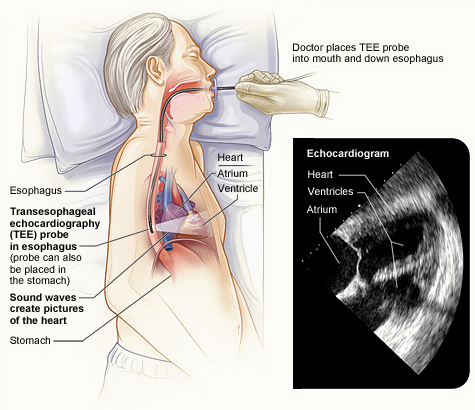 While a Transthoracic Echo (TTE) also incorporates the use of sound waves to collect images of the heart, the transducer device is placed outside of the chest – but when a clearer and more detailed view of the heart is needed, a TEE is required. For patients suffering from a collapsed lung, obesity, or scarring from previous heart surgery – the sound waves can be insufficient to reach the heart area well – making a TEE necessary. The Transesophageal Echocardiography is performed via a flexible tube holding the transducer at the end. The endoscope probe is gently placed down the patient’s throat and into the esophagus to allow observation of specific parts of the heart. TEE is especially helpful in the identification of clots or infections. Prior to your TEE, there is minimal special preparation such as some fasting, as you will be asked to not eat or drink anything – not even water for at least 6 hours prior to the procedure. Bring a list of your current medications and dosages, or simply bring your medicine containers with you. If your Cardiologist allows, you may take your prescribed medicine with a only very small sip of water. On the day of your test, wear comfortable clothing and remove any full or partial dentures. Please inform your nurse before the test if any of your teeth are loose. The TEE test may cause some mild discomfort, but it should not be painful and the back of your throat will be numbed with an anesthetic spray. A plastic mouth guard will be placed into your mouth to protect your teeth. During the test, you will be asked to lie on your left side and you will be connected to machines that will monitor your heart rate, blood pressure, and oxygen levels. A mild sedative by an intravenous line (IV) will be administered to help you relax, but you will remain cognitive in order to hear and interact with the hospital staff. After the test, the numbing effect of the anesthetic will take a little while to dissipate, and you will stay in bed for 1 to 2 hours while the mild sedative wears off. The nurse will monitor your gag reflex often to see that you are able to gag prior to leaving. This is to ensure you do not choke on food or fluids later on, and you cannot eat or drink for at least 1 hour after the procedure. It is normal for your throat to be be a little sore after the test and your doctor may prescribe throat lozenges. Have a friend or loved one pick you up, or another source of transportation, as you may not be capable of driving properly due to some medicines used to help you relax. Once you are home, rest as much a possible, as fatigue may be a symptom for a day or two after the procedure. Test results will be studied carefully to establish whether any previous medical treatment has been effective, and used as a guide when determining if other treatment measures need to be implemented. Treatments for heart disease include making heart-healthy lifestyle changes, some prescribed medicines, and medical procedures as necessary. If you have symptoms caused by the narrowing of an artery, you may need a medical procedure to open narrowed or blocked arteries, such as a carotid endarterectomy (CEA) or a carotid artery angioplasty and stenting. Treatment goals are to prevent you from having a stroke or heart attack and to stop the disease from becoming worse. Your individual treatment depends on how severe the disease is, your symptoms, as well as your age and overall level of health. Prevention is always the best medicine, so we strongly endorse focusing on your heart health to stop or decrease the chance of developing a heart condition. Major risk factors include having unhealthy blood cholesterol levels, high blood pressure, diabetes, and being overweight or obese. A lack of physical activity or a sedentary lifestyle can worsen these risk factors for heart disease. Advice shall be provided about lifestyle changes which can include following a heart-healthy diet, quitting smoking, limiting alcohol intake, and exercising regularly.